A man has been accused of attempted murder after allegedly firing a shotgun at another man in a street. 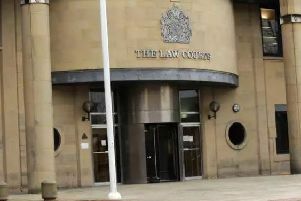 Sam Joseph Taylor, 25, of Rotherham Road, Killamarsh, appeared at Chesterfield magistrates’ court today, Tuesday, October 9, charged with committing attempted murder. Mr Taylor has been accused of firing upon Jacob Fieldsend on Rotherham Road, at Killamarsh, on Sunday, September 30. Prosecuting solicitor Lynn Bickley claimed Mr Fieldsend had visited the road after a dispute with the defendant and he was allegedly shot at by Mr Taylor. Defence solicitor Serena Simpson said Mr Taylor, who was arrested on October 6, denies having anything to do with the incident and intends to plead not guilty. Magistrates adjourned and committed the case to Nottingham Crown Court for a further hearing on November 6. Mr Taylor was remanded in custody. Police had been called to Rotherham Road, at Killamarsh, about 6.45pm, on Sunday, September 30, after reports that a gun had been fired and the area was cordoned-off during Sunday, September 30, and Monday, October 1.